I will be honest with you by sharing the fact I am starting this monthly report at 11pm which indicates just how busy life is at the present time. A few years ago, when I was quite a bit younger, working into the late (and even early) hours was both common and perfectly acceptable, but now since passing that magical 60 mark – I like to be in bed much earlier! The morning and pressures of ‘tomorrow’ seem to come around all too fast! However, with each day very demanding and full of meetings and practical issues to work on, it’s now reached 11pm on Website deadline day before reaching this item which has been on my ‘TO DO’ list for the past week. The biggest time pressure is preparations for Tileagd Assisted Living to be complete and ready to open July 1st. We have undertaken a major restructuring of the facility and as we well know from so many major construction projects, the ‘finishing’ process is far more demanding than the initial construction. Currently, second fix of electrics and plumbing are being undertaken. More Windows and Doors are being installed. Linoleum is being laid in 10 new bathrooms. Over 1,100 square metres (11,000 sq feet) of walls are being undercoated and then final top coats are to be painted. I am thrilled and somewhat relieved that our faithful friend John Chrystal and brother Jim and flying out for a week of intensive painting. As has often been the case before, I wonder how we would manage without them! To help the enormous task to get done, 3 days of Staff Work Days on site have been arranged. 14 staff from a variety of projects will each day, take on a different role to paint, clean and prepare the facility for furnishing. We also have a large Mission team arriving June 5th which of course involves a lot of planning, but we hope during their 2 week visit, even more hands will be available to finish Tileagd Assisted Living (TAL). I appreciate the response last month to supporting the capital costs of the project. We are currently £24,000 ($31,200) short of our total expenditure, so any special fund-raising or designated gift to TAL will be gratefully received. Whilst all the construction work continues, Georgi and her team are beginning the process to be ready to operate. Job Applications are being received and interviews will start shortly. Please pray with us to be guided on the best people to employ for the needs of Assisted Living to be fully met by caring people. Having mentioned ‘on-line’ I must also mention the new website which I have referenced in recent months but is still under construction, largely due to my limited time to approve final format proposals! It is quite a dramatic update, not so much with content, but how it is presented. This was needed due to the software we have been using for many years, is basically obsolete now and no longer serviced by Microsoft and is in fact operated through XP, which is also no longer supported as an Operating System – so we have been under increasing pressure to update the site onto a secure system – which we have now done and are very close to be able to launch it ‘live’ for you to enjoy. Being an ‘old man’ who is less computer friendly that I probably should be, there are some aspects of the old site I will miss. But I appreciate things have to change and improve, so as we have progressed I hope you find your way around the new site once it is uploaded, which I have committed to complete this month. Keep an eye out for it as we will launch it as soon as complete. But if it takes me too long to finish the final approvals, the new site will go live NO LATER than July 1st….. promise! I’m sure you will instantly think the new site is better and easier to navigate, so with confidence I sincerely thank our Site Consultant Simon for his technical input and to Dawn for the hours of work transferring all the content into the new format. I trust it works good for everyone concerned and that the Smiles Foundation website will continue to serve us well for many years to come. On another theme, it is hard to believe we will soon be half way through 2017! It really seems extraordinary to me that in 30 days, half the year will have gone. Time really flies and when I look at the calendar of the second half of the year, I think time will fly even quicker! 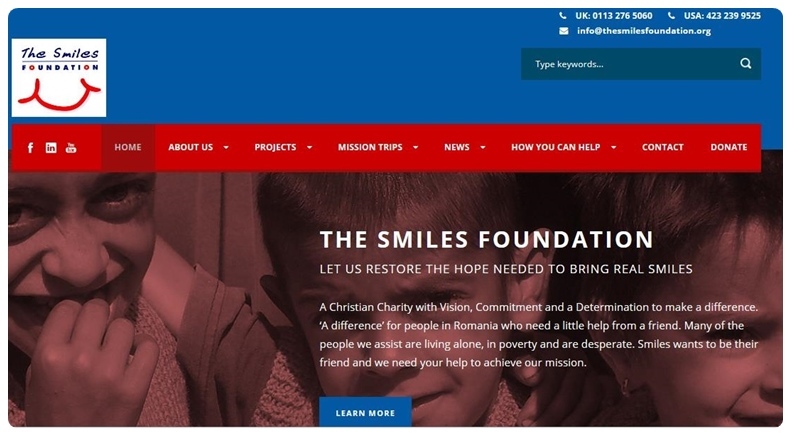 We start in June, three consecutive months of busy Mission Teams coming to Smiles to serve God through the projects we have here in Romania and helping people in need. With a little holiday time in September following the busy summer, October is already booked again with Mission Teams. In November we are planning some major promotional work visiting UK and America before the usual busy December of Mission teams helping people understand the real meaning of Christmas. The November plan currently being worked on is a team of Project leaders to tour the United Kingdom with Barbara, Luke and Dawn – while I head off to America for one of my famous whistle-stop trips covering … I dread to think how many miles! We are hoping Maria will be able to join me in America but for that of course there are a few family factors to consider. Dawn for the UK and myself for America will be contacting folk over the coming weeks to try finalising a schedule for both trips. I hope you will be able to welcome us whichever side of the Atlantic pond we are on. I am delighted to see reports again this month from Maria, Georgi, Adi and Barbara. Please take time over the coming days to read them all. 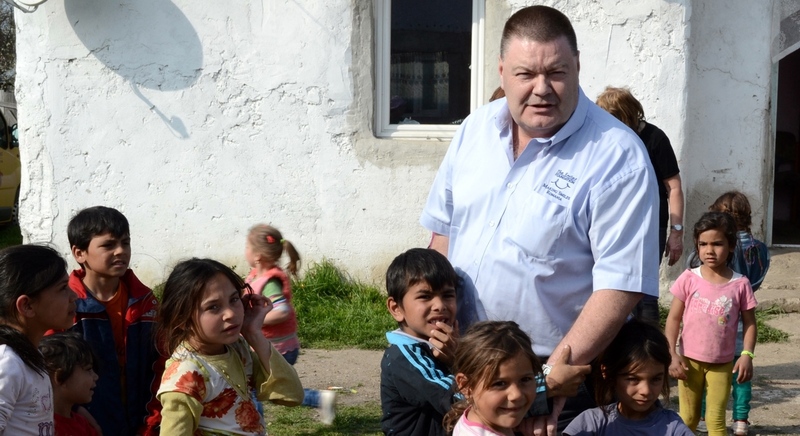 Each is different but all important to share what God is doing here in Romania and how you can be a part of it. Be sure to also see our Thankful Heart message this month that comes from our Gepiu Project. As always, there is plenty going on as these reports from those on the ground will indicate. The only better way to understand all that is happening is to come and experience it for yourself! I am thankful that many of you are and I look forward to welcoming you to Romania over the coming weeks and months. Thank you for your wonderful support, your prayers and interest in all we do. Maria – Happy Sunny Days! !